NO IDEA is a Swedish Crossover/HXC band from 1986. 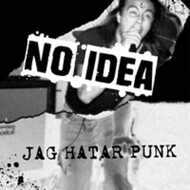 Jag Hatar Punk has been fully restored and remastered! While there is a lot of music from this era being reissued this is truly one of those hidden gems that needed to be made available to the world. Jag Hatar Punk unleashes thirteen songs of Crossover/HXC that will blow you away. Being in the right place and time this band could have gone onto be big like many of their peers in the US. Regardless of how unknown they were this record stands out as one of the best crossover/HXC records of all time. While this will certainly be a release sought out by collectors; any fan of Crossover/HXC will need to have this album!